 This essay will address several issues that are raised by the phenomenon of belly dancing and its transformation, globalization, and acculturation in the West; it is designed to develop a newly emerging area of performance/cultural research, drawing from the fields of dance and transnational studies. Using the solo Middle Eastern form as the site of production of the rapidly expanding genre of performance labeled "intercultural performance," we hope to interrogate that genre and its definitions as a way of investigating the changing relationships between "ethnic" and "hybrid" and the related national and cultural boundaries associated with them. For some time, ethnic artists have collaborated with Western artists and/or strategically deployed Western aesthetics within or alongside ethnic performance forms, complicating the "cross-cultural" aesthetic, historical, and ideological dialogue implicit in this study. Shay, Anthony and Barbara Sellers-Young. 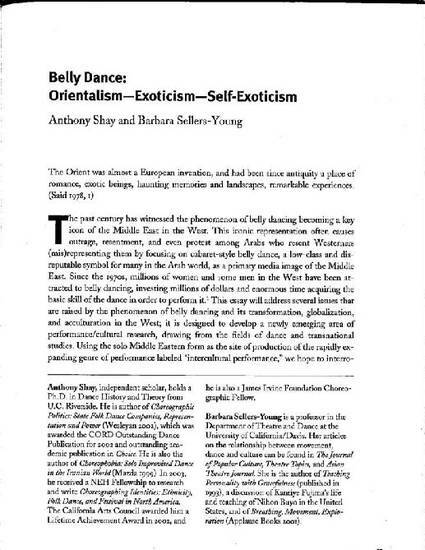 “Belly Dance: Orientalism-Self-Exotocism-Exotocism,” Dance Research Journal 35, no. 1 (Summer, 2003), pp. 13-37.